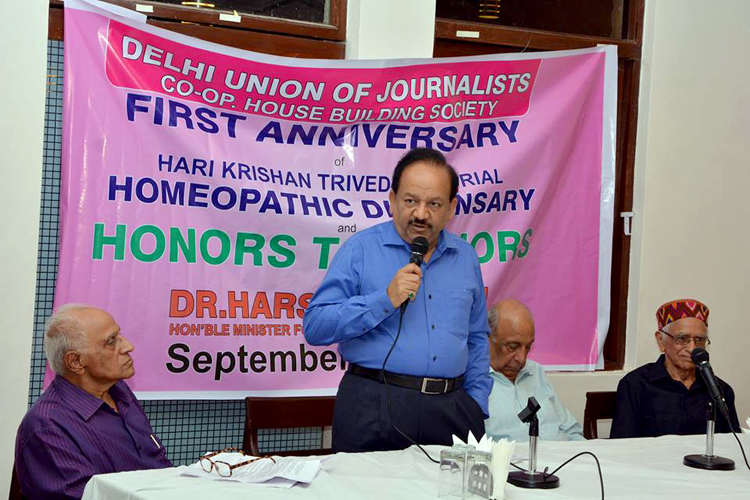 NEW DELHI.SEP.16: Dr.Harsh Vardhan, Hon’ble Health Minister, Government of India inaugurated a free medical camp organized by the Delhi Union of Journalists Cooperative House Building Society. The camp was organized to mark the first anniversary of the founding of the Hari Krishna Trivedi Homoeopathic Dispensary. He said “The government is placing the highest importance on popularizing holistic treatment by establishing preventive and promotive care facilities for and traditional medicine throughout the country. The Union Cabinet’s approval of the National AYUSH Mission will set in motion a series of steps to plug the gaps that exist in the public health system, particularly in inaccessible areas. I have already set up an expert group comprising experts in Ayurveda, Yoga, Unani, Siddha and Homoeopathy (AYUSH) to recommend the best methods of treatment for the public. We will give AYUSH pride of place in the country’s public health system. No single stream of medicine is considered supreme in today’s world. Vast strides have been made in our traditional lines of treatment and we wish to bring their benefits to the people. The upcoming All India Institute of Medical Sciences (AIIMS) in Rishikesh will have a 100-bed Centre of Excellence in holistic medicine. Soon holistic medicine would become a feature of all the leading hospitals of the country”.